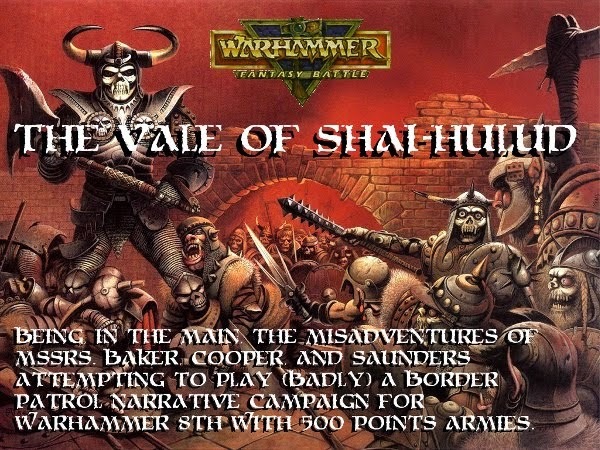 The Vale of Shai-Hulud - 500 point Border Patrol Narrative Campaign for the WARHAMS! Salacious scratched his bulbous Gnoblar nose and frowned at his complete lack of comprehension of what the hooded figure was attempting to say to him. Normally pre-campaign negotiations with the humies or stunties were easy. As the only semi-literate and semi-numerate member of the exiles of the Crippledick Peak tribe of Ogres (a phenomenon believed to have originated when he was dropped on his head by the Hobgoblin midwife) he was usually ushered into the chief's tent to read the contracts and sign his name on them. Monetary compensation was mentioned, the chief growled, that figure went up, evenually the chief stopped growling, the gold was accepted and Salacious signed the paperwork on the chief's behalf. But this was radically different. The messenger was hidden beneath a voluminous soft grey coat, a colour matched by the silk gloves that poked from billowing sleeves. A wide-brimmed grey hat, similar to those worn by the plague doctors, sat upon the mysterious figure’s head with a veil hanging down to obscure the wearer's features. Salacious prided himself upon having an ear for accents - as far as he could tell this humie had none. "So, to sum up retrospectively. My employer, hereinafter referred to as the hiring party, finds it desirable that your freelance military company of condottieri marches post-haste to the memorial interment site of one Lady Miasma Undergusset, deceased gentle-lady of this diocese. Upon investing this position your master is hold and deny possession of such position forthwith to a large migratory presence of Rodenticus Chaotica that my employer, hereinafter referred to as the hiring party, believes via intelligence received from the usual channels purveyors of such mentioned espionage-related intelligence to be attempting to secure this tomb and surrounding environment." "This tactical manoeuvre is required to deny the under-lying subterranean ossuary to the said belligerent host of Rodenticus Chaotica (hereinafter referred to as the enemy, or "the belligerents") who are believed by the aforementioned hiring party to be desirous of working and extracting the veins of the solidified and calcified forms of the essence of Chaos stuff, ejected from boreal polar regions in antediluvian times when interstellar wormholes created by an ancient race of batrachian humanoids imploded. My employer, the hiring party, has strong feelings upon this undesirable event coming to pass and the possible scenarios forthcoming of such event or events." "Upon securing and the eventual defeat of the belligerents, monetary compensation will be paid via mutually acceptable channels. This compensation is currently held by third-party escrow and has had a considerable multiplier applied to it when compared to similar compensation for military endeavours as ascertained by examination of the current going rate as found upon the open market, and projected future trends. Any questions? I believe you will find the paperwork and conditions to be satisfactory". A weighty scroll was handed across to Salacious. The Gnobblar noticed it was sealed with a lump of dark red wax bearing the monogram "E-G". Golfbag Offaleater turned his immense, scarred and bruised Ogrish skull towards Salacious and rumbled a query. "I fink the humie wants us to go somewhere near here and kill something dead. He will give us gold." "The Chief says he'll be delighted to accept your business proposal. Where do I sign my X?"